Taxonomies are potentially very powerful to offer a variety of grouping or selection of events. 4. Setup a calendar or agenda page, note the url as your calendar url. 5. Drag the “Event Taxonomy Archives” widget to the sidebar used on the calendar page and configure the widget. Remember to add the calendar url to the widget settings. 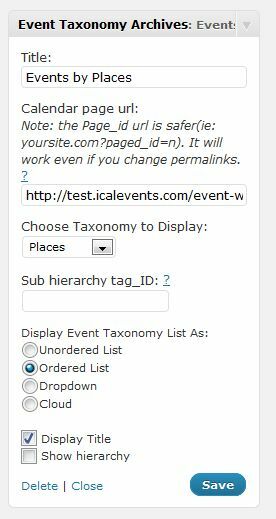 Event taxonomy widget on one page only?